Just over three years old, Clash of Clans rakes in more than $1M $5M5 each day and consistently charts in the top three grossing apps6. It’s the app that new game developers look to for inspiration. However, the future didn’t always look so bright for the game’s creator, Supercell. In mid-2011 the year-old company realized their web- and Facebook-first strategy would never generate the hit game they needed7 (this was late in the Facebook game fad), so they quickly shifted to a tablet-first strategy and killed all their old games8. At the time, smartphones – and particularly tablets – were an unproven market, but their daring strategy worked out. 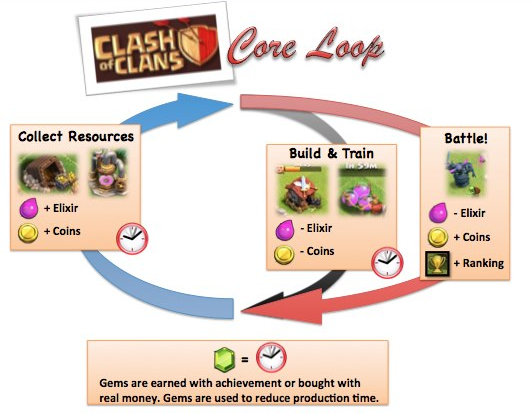 By mid-2012, Supercell had launched one tablet game and killed two, but they were getting closer to the goal. Success finally came in May 2012 when the newly launched Hay Day quickly proved to be a hit. Following close on its heels, Clash launched in August 2012 and became the #1 top grossing game in the US within 3 short months9.